Are you looking for a furnished apartment in a central location? Then we have for you a delicious and well maintained 3 (former 4) room apartment of approx. 70 m². 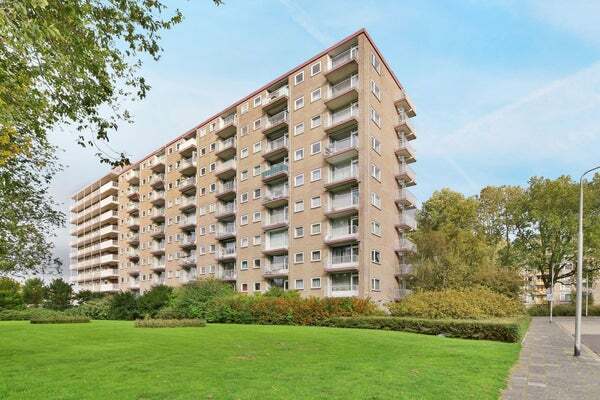 It is located in an apartment complex in the residential area Elsrijk-Oost, within walking distance of "Stadshart Amstelveen" and right opposite the tram 5 and metro 51 stop. The apartment on the seventh floor has a nice balcony on the west with a beautiful view. The complex has 72 apartments spread over 9 floors. Entrance with doorbells, intercom and mailboxes. In the closed central hall there is also access to the box corridor with its own storage. There are 2 elevators in the stairwell. Through the entrance on the gallery side you enter the cozy living room with the balcony. On the gallery side is the neat open kitchen located. Here also a beautiful view over a beautiful and green piece of Amstelveen to the tram stop Onderuit. The open kitchen makes the living room bright and sunny. In the inner hallway there is access to the toilet and to the two bedrooms, which have a practical built-in wardrobe. The master bedroom is located at the rear. The bathroom is accessible via the front bedroom on the gallery side and equipped with a shower with thermostat knob, washbasin and connection for washer / dryer. In the vicinity are several good schools and several supermarkets. In and around the nearby luxury shopping center "Stadshart van Amstelveen" are also located among others the theater, the museum and nice and varied catering establishments. Amsterdam Zuid can be reached by car within a few minutes via the Beneluxbaan, which also offers direct connection to the A1, A2, A4 or A9.